Paradise. 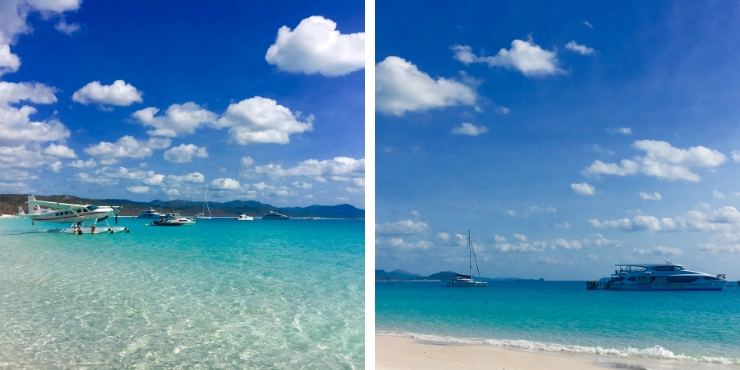 That one word sums up our Whitehaven Beach Day Trip with Cruise Whitsundays. Consistently named as one of the most beautiful beaches in the world Whitehaven Beach with its pure white sand and stunning location is a must-visit destination for people in Australia and across the world. Whitehaven Beach is found in the Whitsunday Islands, a group of 74 tropical islands off the Queensland Coast in Australia. 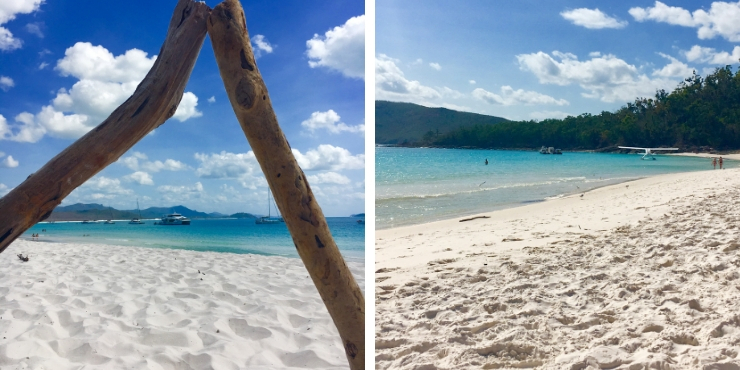 After looking at various Whitehaven beach tours from Airlie Beach we decided to take a half-day trip with Cruise Whitsundays. This option suited us as we were restricted by other commitments. 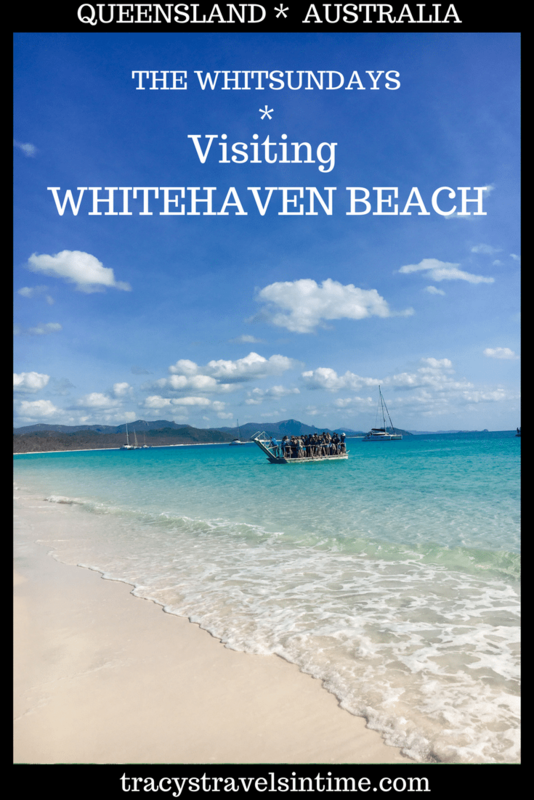 A day trip to Whitehaven beach was all we could manage to fit in but we were still eager to visit. If you are considering which day cruise to take out to the beach this guide will give you an idea of what to expect from the Cruise Whitsundays half-day tour as well as tips to ensure you make the most of your day. 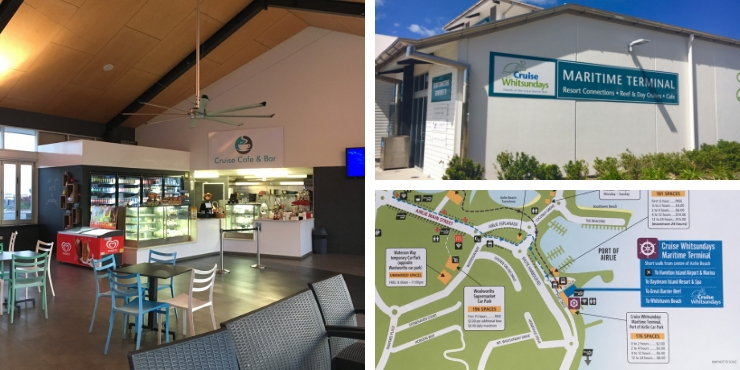 Check-in is at the Cruise Whitsundays Maritime Terminal. 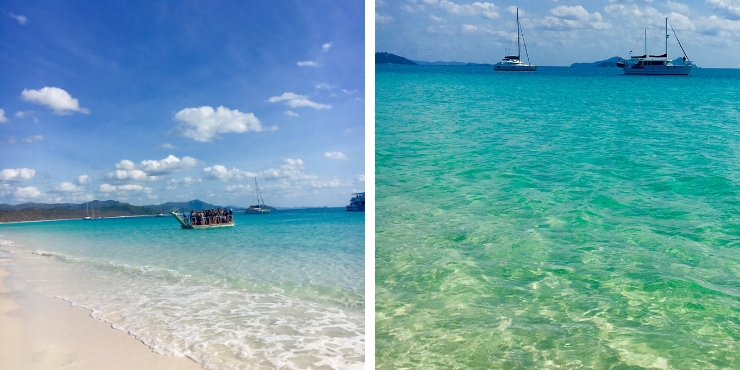 For the half-day morning cruise check-in is at 6.30 am (there is an afternoon Whitehaven beach tour available too). Parking is available at the terminal. It cost us $6 for 12 hours and there was plenty of spaces available at 6.30 am when we arrived. If you don’t have time to eat breakfast prior to check-in there is a cafe at the terminal. We boarded the Cruise Whitsundays boat at 6.45 and were met by a very friendly and approachable crew. We were kept us informed of the itinerary during the day . The crew were also very knowledgable and told us lots of interesting information about the islands as we sailed through. The boat stops at Hamilton Island to pick up more passengers and then sails directly to Whitehaven Beach. Due to the possibility of stingers we were all offered a stinger suit if we wanted it before arriving at the beach. After arriving at Whitehaven you transfer to the beach on a smaller boat. First steps on the pure white sand of the beach are magical. The sand is 98% pure white silica and felts like no sand I have stood on before. It is so fine it is possible to clean jewellery with it. It also does a great job of exfoliating feet. Make sure you keep phones and cameras away from the sand as it will scratch surfaces. Once everyone is on the beach the Cruise Whitsundays crew will set up a covered area on the beach where you can get water when you need it. We had bought sandwiches and snacks on the boat to eat on the beach though the seagulls were a slight problem. If you are on the half-day trip there is 2 1/2 hours to enjoy the beach before transferring back to the boat. We visited in early September and although it was hot it wasn’t unbearable. I would be concerned about the lack of shade if visiting in the summer months. 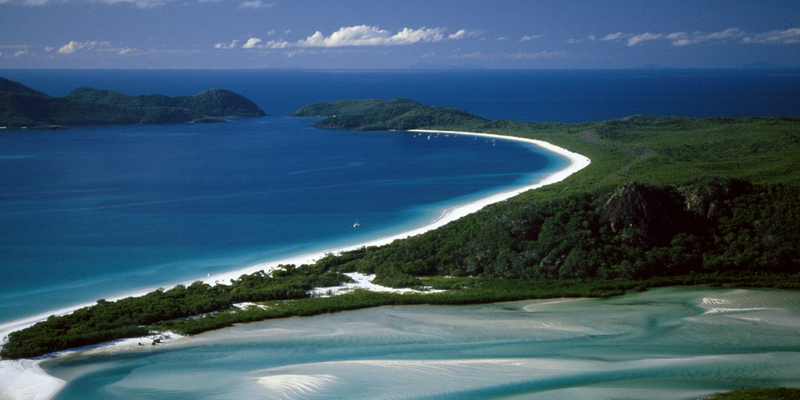 The white silica sands stretch for over 7 kms along Whitsunday Island. The sand is truly dazzling and combine that with the crystal clear water and you will feel like you are in paradise. There is plenty of space to put down your towel and enjoy the views – relax, chill out and enjoy your time on the island. Take a stroll along the beach! Keep an eye out for the seaplanes which land and take off just beside the beach! Check out the local wildlife! Once the 2 1/2 hours is up everyone transfers back to the main boat. Make sure to shake yourself, bags, shoes etc and leave the sand at the beach rather than take it with you. Your feet will be washed as you get back on the boat to remove any last grains. During the return journey refreshments and cakes and biscuits were available. The boat heads back to Hamilton Island where you change to another boat for the return trip to Airlie Port. Arrival time was approximately 1.45 pm. Check out the Cruise Whitsundays website for up-to-date information and bookings for a Whitsunday island tour. The morning half-day trip costs $115 each (per adult) and $55 each for children aged 4-14. Complimentary coffee and tea is available on the boat throughout the cruise. Sandwiches, crisps and snacks are available to buy during the cruise as well as soft drinks, beers and wine. Whale watching! Keep an eye out for whales between June and November. Humpback whales migrate from Antarctica every year to give birth in the warm waters off tropical Queensland. Remember to take your swimsuit, towels and suncream! There are toilets accessible just behind the beach. 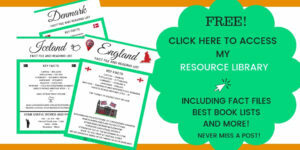 Check out this fabulous guide if you are planning to snorkel and want to know what gear you need – it tells you everything you need to know! 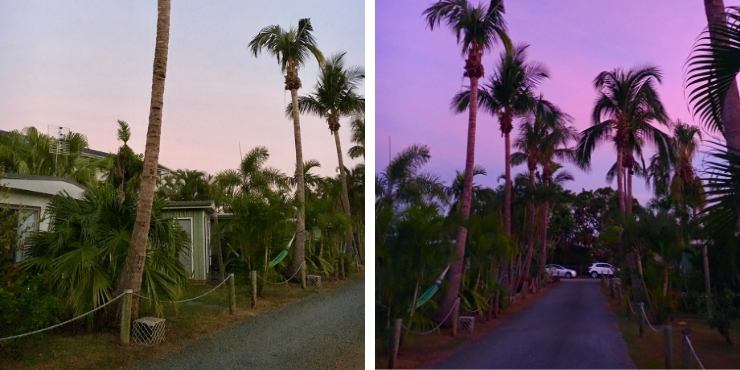 We spent an evening in Airlie Beach before travelling to Whitehaven Beach. We chose to stay at a more budget style accommodation as we arrived late and were leaving early the next morning. Bush Village Budget Cabins were clean, comfortable and exactly what we were looking for when we stayed in Airlie. CLICK HERE to make your own booking at the BUSH VILLAGE BUDGET CABINS perfect for budget conscious couples and families. Why not FLY over the Whitsundays? This one hour scenic flight will give you the opportunity to admire the Great Barrier Reef from above. See the world famous Heart Reef one of the most iconic sights in Australia. »CLICK TO BOOK YOUR SCENIC FLIGHT OVER THE WHITSUNDAYS – A ONCE IN A LIFETIME EXPERIENCE! Want to see more of the reef? Why not join this 10 hour trip to a pontoon on the outer reef area. Enjoy a day swimming, snorkel or jump on the semi-submersible boat. And the ultimate way to see the Reef, islands and enjoy a day at the beach? Take a helicopter ride of course!! I actually have a friend who did this and loved it so this is definitely on our itinerary next visit. Why not treat that special someone in your life to a day they will never forget? »CLICK TO BOOK THE ULTIMATE EXPERIENCE – A HELICOPTER TRIP OVER THE REEF AND LANDING ON WHITEHAVEN BEACH! 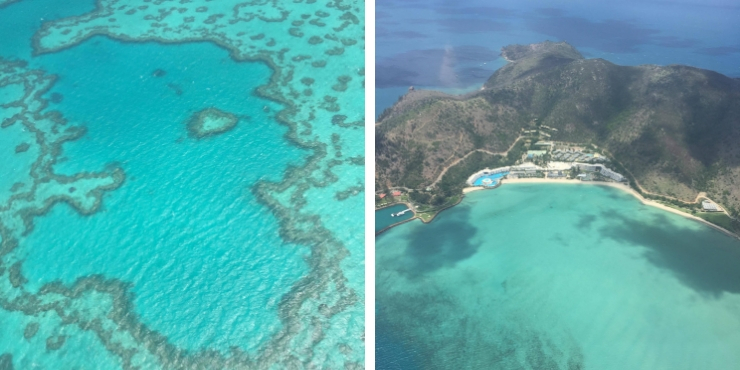 Photographs courtesy of K Partridge – taken from a helicopter on the way to Whitehaven Beach! Whitehaven Beach is located on Whitsunday Island the largest of the islands that comprise the ‘Whitsundays” off the east coast of Australia. The nearest town is Airlie Beach. 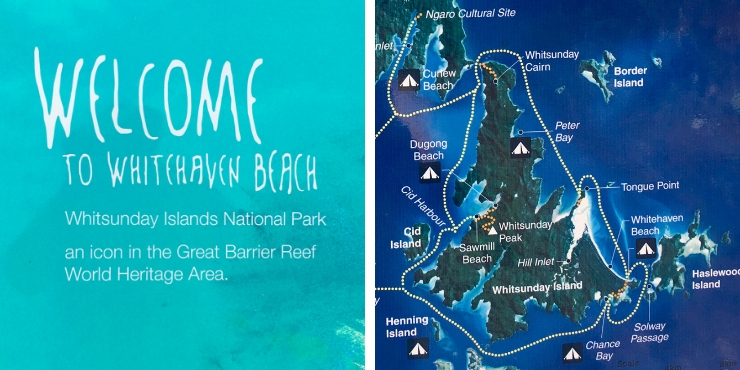 How to get to Whitehaven Beach? There are numerous tour companies offering day trips to the beach. Take your pick between boat/plane/helicopter! 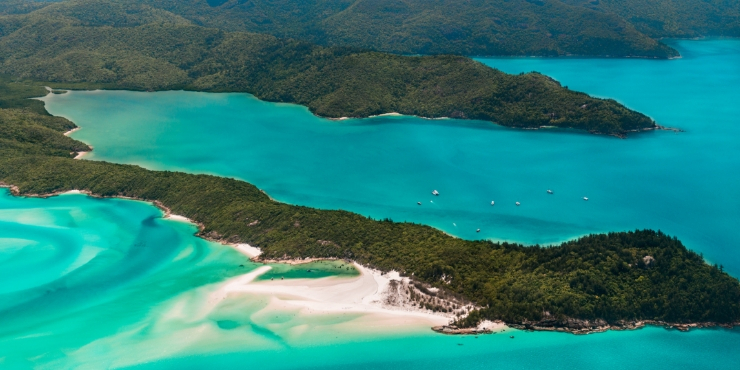 When is the best time of year to visit Whitehaven Beach? Marine stingers may be present in the waters of tropical Queensland all year round but may be more prevalent from October to May. We visited in early September and chose not to wear stinger suits but you do so at your own risk. Due to the hotter, wetter weather between those months I would recommend visiting between June and September. 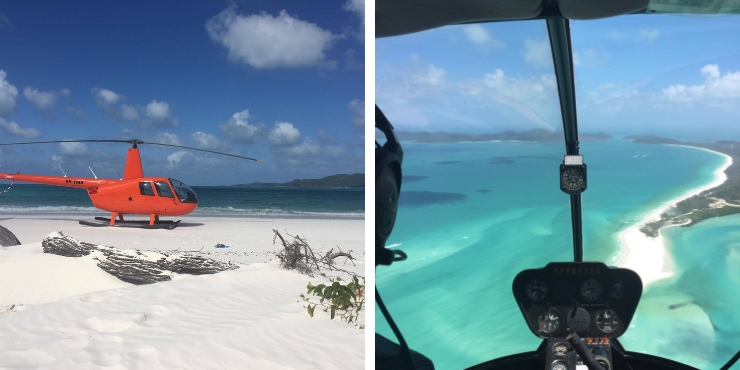 Photographs courtesy of K Partridge who had an amazing helicopter trip to Whitehaven Beach! When you are visiting Whitehaven Beach and the Whitsundays you find yourself in the heart of the Great Barrier Reef a UNESCO World Heritage Site since 1981. I have lots of posts all about visiting Australia and a number of these are focussed on the beautiful state of Queensland. With an enviable climate, wonderful wildlife, stunning beaches if Queensland is your destination these posts will help you get the best of your visit! If you are seeking some inspiration these 15 photographs will have you booking the next flight! Other places to visit in the region of Airlie Beach are Bowen and Mackay. Next Post Things to do on Vancouver Island – an insider’s guide! so beautiful! and it’s an UNESCO site? awesome! Definitely! 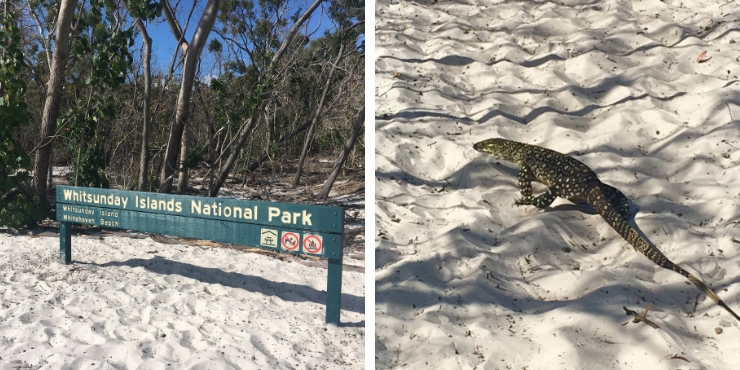 So lucky to have such amazing beaches in Australia and Whitehaven is really special – that sand is incredible! And I thought the Maldives were the only paradise ? 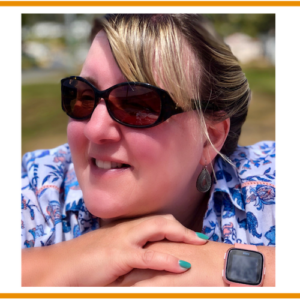 Great post Tracy, looks fab. Yet another place for the bucket list ??? I know! The sand at Whitehaven is amazing its like flour!! Never seen anything like it – all beaches will seem inferior now lol!! I wasn’t too impressed with Whitehaven Beach, but I did like Hill Inlet! Oh why not? We will make sure to get to Hill Inlet next time if you recommend it! Yes it is amazing – plan to go next time for longer! It sure is Angie – that sand is just the most amazing ever!! No beach will compare for the quality of sand! And that ocean! Stunning! Whitsundays are just stunning! Looks like you had a wonderful day, Tracy. I had to laugh when you mentioned the stinger suits – when we visited, I received the only stinger suit in a different colour than the rest of the group. They said that if there are sharks around, that’s the colour they’ll go for first. 🙂 Luckily we didn’t meet any sharks, and snorkelling was just amazing there. Let me know the colour Jurga so I can avoid it next time!! Luckily not stinger season when we visited but we still kept a look out! Yes we were lucky as its not jellyfish season though we were offered stinger suits just in case. The beach is incredible – the most amazing sand! It is! 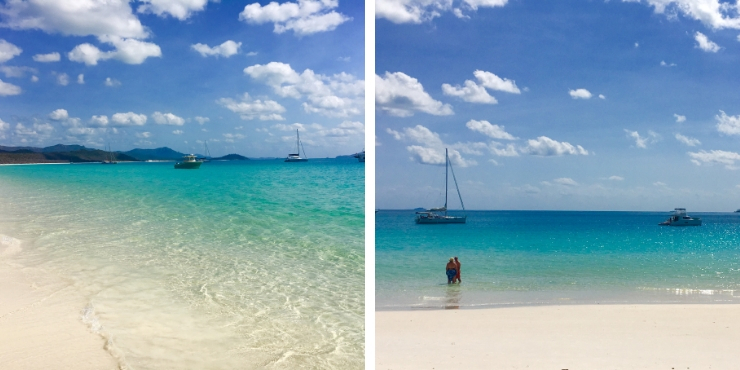 And only an hour and a half by car – then a boat ride through the beautiful Whitsundays! Thanks Erin! It certainly is stunning! I can’t wait to go back! Wow, that really took me back. I sailed around the Whitsundays for a week many years and Whitehaven was a highlight o fthe trip. So white sunnies hardly stop the glare. I’m pleased you enjoyed it. I hope you’re settling in well to Mackay life. Thanks Shona! 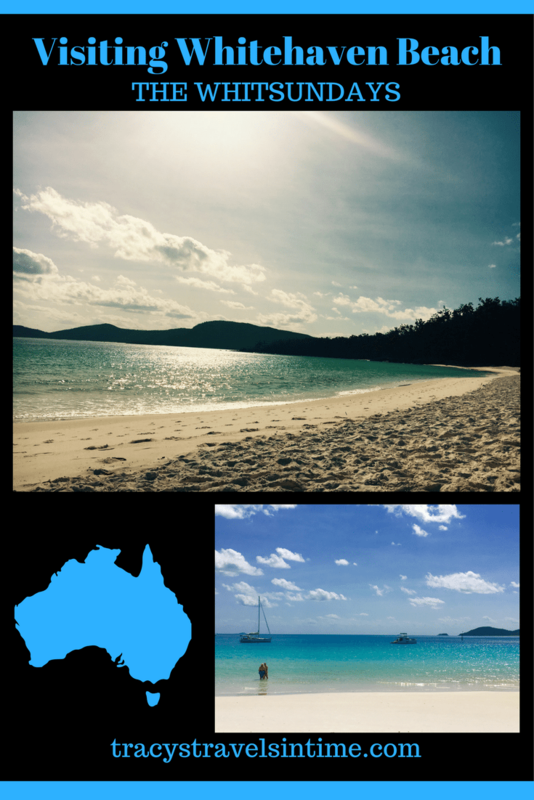 The Whitsundays are beautiful and we just loved Whitehaven so much we cant wait to go again! I would definitely take the Cruise Whitsundays to the Whitehaven beach if I was in the area. The fact it is a UNESCO site is a bonus. I am on a mission to see all the seven natural wonders of the world and the great barrier reef is one of the two I have yet to see! I’m curious to how the sand feels on the feet out there too! Like flour David! It is so fine and soft! Will look forward to hearing what you think! And definitely book with Cruise Whitsundays! Yes definitely a place to explore! It truly is a beautiful beach! Ah, now I’m making connections! 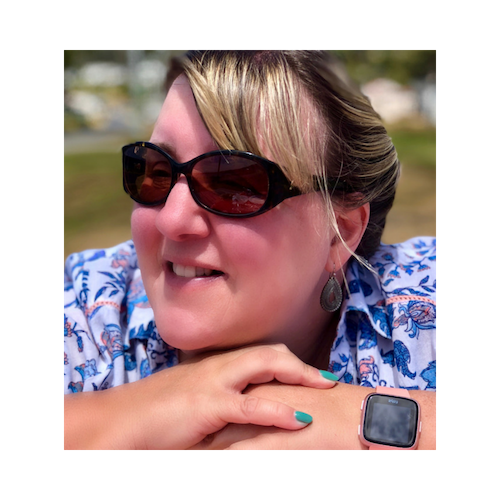 I kept hearing about the Whitsundays but didn’t realise where they were – now I know! Sounds like a cool trip! I’ve pinned for later. Was a great trip and we are planning another weekend there soon though it will be stinger season so may have to wear a stinger suit!